Many industrial companies work with expensive capital assets, such as machinery, which needs to be carefully maintained and serviced to ensure smooth operation. The manufacturers and third-party service providers of this machinery want to serve their customer base with efficient and effective field services. Traditionally these capital assets are registered in an asset management system, which is integrated with a field service system for corrective and preventive service and maintenance. However, it is often hard to get the actual status information and usage figures of those machines and equipment for better management, more adequate service and more optimized Service Level Agreements (SLAs). The integration with a real-time industrial Internet of Things solution, which is capable of acquiring and processing actual machine data, is very valuable for those companies that want to adopt condition-based maintenance and predictive maintenance. In this blog post we describe the integration of innius, the industrial IoT solution, with an asset management system and a field service / maintenance management system. First we describe the business case with a number of opportunities and challenges. Then the solution is introduced, answering those challenges and providing insight in the benefits that may be obtained. We conclude with a brief look into the future of integrated asset management, field service and maintenance management. In part 1 the outbound integration between innius and a backend enterprise application is described. In part 2 the topic will be the inbound integration for industrial analytics purposes. Acme BioFood Ltd. is a food processing company with a large production plant. In the plant several production lines have been realized in which machines from various manufacturers have been installed. The machines in the older lines were actually purchased by Acme, while the machines in the newest line have been leased. Acme uses an enterprise asset management (EAM) system to keep track of the capital assets it owns, including acquisition details, financial status and actual usage. Acme’s own technical department performs maintenance on the machines. They use a maintenance management (CMMS) system for maintenance planning, work orders and spare parts. Both the EAM and the CMMS system are part of the Acme ERP system, which is Microsoft Dynamics. JD Machines Inc. is an important partner for Acme. During their long-term relationship they have sold and delivered a number of machines for the older production lines of Acme. For the newest line the JD machines have been leased to Acme and these machines are maintained under an SLA. JD Machines is investigating opportunities to move to a machine servitization model, where they provide their customer with a full-service machine offering on a subscription basis. 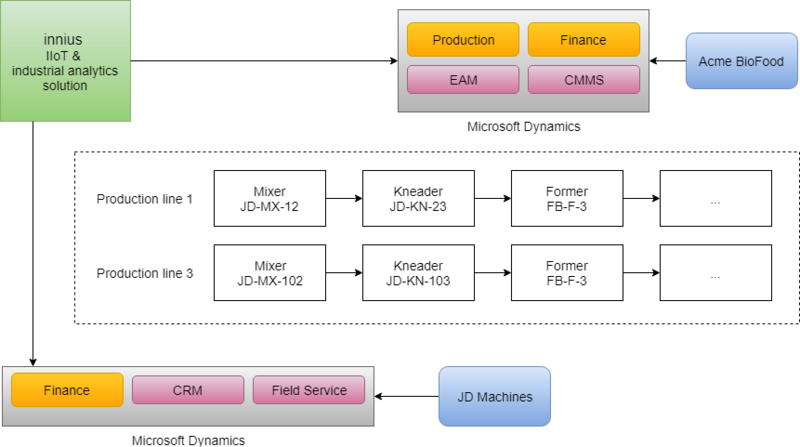 JD uses a field service system (FS) integrated in their customer relationship management (Microsoft Dynamics) system. In the diagram below you see an overview of the case. capacity utilization. The machines (capital assets) were purchased to produce a certain planned number of products per time period. Currently the actual number of products per time period is registered manually, with long intervals between them. That means there is insufficient insight in the actual utilization of the machine. The financial consequences for return on investment, product cost price, and asset valuation and depreciation are therefore less reliable. energy consumption. The machines were estimated to have a certain energy consumption and the operating costs are calculated based on these numbers. However, the actual energy consumption is only known on plant level, making it hard to optimize energy usage per asset and negotiate optimal energy contracts. maintenance planning. As there is less information available about actual usage, such as running hours or wear and tear, the maintenance planning needs to be based on the less than optimal maintenance and replacement schedules as defined by the manufacturer. It is also difficult to anticipate on machine failures as specific information about the state of the machine is not used in the maintenance management system. cost accounting. Currently it is not easy to do detailed cost accounting for production orders, as the actual data is not gathered very frequently. field service. The lack of actual usage data and status data about the machines requires JD to stick to the traditional ways of scheduled field service visits to Acme in order to inspect and repair the machines. In case of an emergency situation JD Machines’ service department does not have the detailed information about the situation available and runs therefore the risk that either the technician is not qualified or the required replacement parts or tools are not available during the first visit. This results in higher costs. online monitoring and assistance. For JD Machines it is very important to be able to monitor machines from their HQ, as that will both reduce travel costs and allow expert personnel to be used more efficiently. machine as a service. The CEO of JD Machines realizes that if they want to move forward with the new business model of servitization, it is critical to have actual machine data, including usage data, status data, fault data and maintenance data. That data must be correlated to find causal relationships. Some of that data comes from the Field Service system, but the actual data needs to come from the innius system. The solution for the problems described above consists of multiple elements. This solution enables Acme to see and act upon the real-time performance data of the production line. Out of the box innius provides insight in machine performance and behaviour using the physical sensors on the machines and virtual sensors that combine data from other sensors to produce additional information. 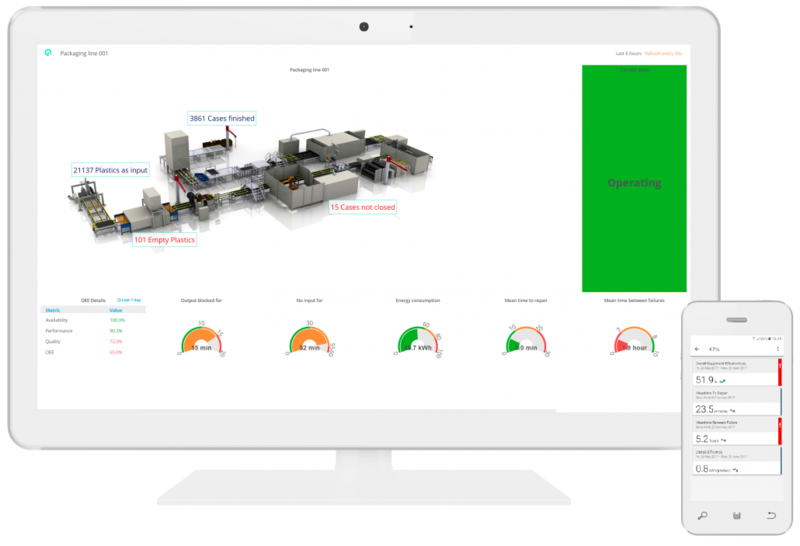 Innius also provides a number of important KPI’s, including the Overall Equipment Effectiveness (OEE), Mean Time Between Failures (MTBF), Mean Time To Repair (MTTR) and Energy Efficiency (EE). The sensor values and KPI’s are shown in the mobile app and on the dashboard for immediate use. User-defined thresholds and associated actions make it possible to quickly react on emergency situations at the machines on the production floor. With innius Acme is able to see the actual performance and energy consumption figures. Acme uses the innius machine sharing capability to give JD Machines read-only access to the real-time machine data. With that information JD is able to optimize the field service assignments. They are also able to remotely monitor their customer’s machines. Then they are able to advise the customer in real time about emerging situations and suggest appropriate mitigation actions. Register the usage (machine counters), energy consumption and other values as meter values on the asset. These meter values are then available for preventive maintenance planning, cost calculation, replacement discussions or sustainability budget comparisons, among others. For example: in cost accounting the actual hourly production cost of machine M1 is actual kWh * price per kWh + … The actual kWh is reported by the machine at runtime. The data about actual usage of machines is important input to the capacity utilization calculations. Use the detailed machine usage log during the periodic assessment of assets for reconfiguration, replacement or phase out. The usage information is also useful for calculating the energy efficiency and sustainability. Create and schedule a preventive maintenance work order based on the accumulated usage of the machine. For example: after 1500 running hours an inspection for machine M1 must be carried out. Trigger a condition-based maintenance work order based on actual wear of a ball bearing. The maintenance planning become proactive through the use of real-time signals about machine status. Trigger a predictive maintenance work order based on the forecasted failure of machine M1. The forecasted failure is calculated in innius using the input of multiple sensors and the application of the ARIMA forecasting technique. Issue a purchase requisition request for a part that is reporting failures. Use the machine history for detailed analysis of the ROI and TCO of machines, in order to optimize purchasing new equipment for Acme. Use the machine utilization and maintenance history for detailed analysis of the total cost of a machine, in order to optimize a contract for machine-as-a-service to be offered to new JD customers. Detailed cost calculation is critical for industries with low profit margins, such as CPG companies. The diagram shows how the innius integration with a backend system allows for proactive initiation of important operational and managerial processes regarding assets. more profitable as the utilization of capital assets is closely monitored and production costs are optimized. more pro-active in maintenance and service, as the signals from the production floor are used to trigger maintenance tasks instead of complex task planning. more agile in production planning as it receives real-time progress indicators and production status information. more cost-effective as it can order spare parts just-in-time. more sustainable as the energy consumption is monitored more closely and optimized more aggressively. more customer-centric as the insight in batch planning and changeover times allows more optimal batching. However, it is not only operational processes that benefit from the integration between innius and backend systems. The integrated and aggregated datasets that result from the integration are useful for deeper analysis of the actual operations of the company. The industrial analytics capabilities of innius, particularly for the domain of production logistics, are described in our blog post regarding Release 2.0 which includes the Production Logistics Data Report.